I sort fall vegetables into three planting groups based on two criteria: time left in the growing season and soil temperature. By early August, time is the deal killer for broccoli, cabbage, and their close cousins in all but the mildest winter climates, but there is plenty of time to grow other cool-natured vegetables rated at less than 60 days to maturity. Keep in mind that when growing anything in fall you should add about three weeks to the maturation times given on seed packets. Just as soil temperatures near the surface rise rapidly late spring and early summer, they decrease quickly in late summer and early fall. To get a good idea of your soil's temperature 4 inches (10 cm) deep, these soil temperature maps of the US and Canada can help guide your thinking. When grown as fall vegetables, these seven crops will germinate rapidly in surprisingly warm soil as long as they are kept moist. Ideal germination temperatures range between 65-85°F/18-30°C. Maintaining moisture can be a challenge, so sow seeds just before a period of wet weather is expected if you can. Covering seeded beds with old blankets on hot, sunny days also can aid germination. Beets may surprise you with how quickly they germinate in late summer, which is lightning fast compared with their behavior in cool spring soil. Kale is a shade hardier than collards, and the plants are so frilly and colorful that they qualify as edible ornamentals. Leeks sown in fall may only reach pencil size before winter comes, but seeds more than two years old may lose viability by spring. You may have nothing to lose by planting them. Endive and escarole grown in the fall garden have big, crisp hearts, and they taste less bitter compared to spring-grown crops. Spinach can be planted three times. 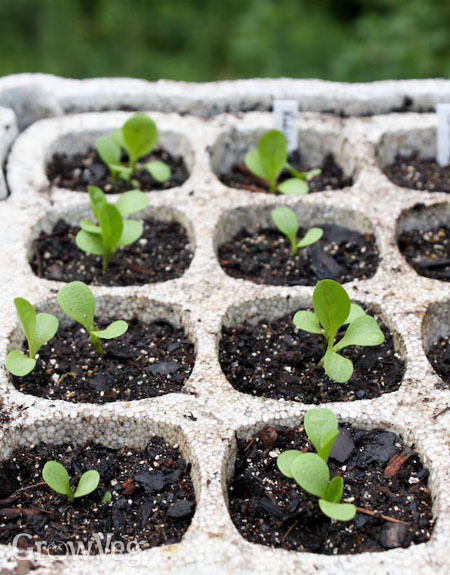 Start a few seedlings indoors for an early fall crop, and sow more outdoors when soil temperatures are below 70°F/20°C. A third sowing can be grown through winter beneath a protective frame for harvesting in early spring. Signs of autumn are often apparent by the time the soil cools enough to grow the leafy greens that define many fall vegetable gardens. Diversify by trying new varieties, especially Asian greens like mizuna and tatsoi. Cool temperatures tame flavors, so many gardeners wait until after a frost or two have passed to harvest arugula and various members of the mustard family. Arugula grown in fall has wonderfully mild flavor, and fall-grown plants become large and leafy and rarely show interest in bolting. Cilantro is another crop that bolts right away when grown in spring, but holds much longer in the fall vegetable garden. Lettuce from your fall garden may include the same varieties you grew in spring, or you can choose varieties based on their cold hardiness. Many catalogs offer cold-tolerant "winter" lettuces. No fall vegetable garden has room for everything, but by choosing favorites from these lists and giving them a proper start, you will have an abundance of fresh veggies for months to come.